As you also know, I'm picky. So when I got introduced to this dish, I wasn't sure. But now I love it. Bottom line of that? If I love it, you will too! Mix the ingredients with hands, shape into about twenty 1 1/2 inch balls. Heat to boiling, stirring constantly; reduce heat. Add meatballs. Cover; simmer, stirring occasionally. 10 minutes. We usually make noodles to go with it! This sounds really good. 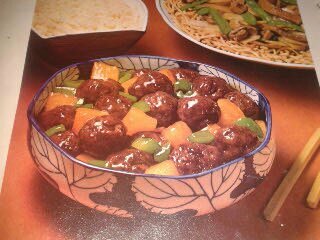 I've had a few variations of sweet-and-sour meatballs and they've all be pretty tasty. There are some weird recipes for them out there, though; a friend of mine makes hers in the slow-cooker with a sauce that's made of a jar of grape jam mixed with a bottle of ketchup and I think there's rum mixed in. They're called Drunken Meatballs and they're actually really good!